When the Dalai Lama was forced to go into exile in 1959, he could take only a few items with him. Among these cherished belongings was his copy of Tsongkhapa’s classic text The Great Treatise on the Stages of the Path to Enlightenment. This text distills all of the essential points of Tibetan Buddhism, clearly unfolding the entire Buddhist path to enlightenment. 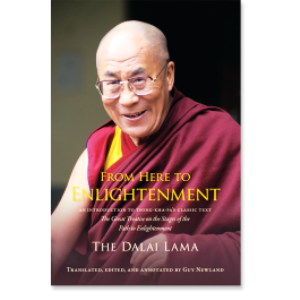 In 2008, celebrating the long-awaited completion of the English-language translation of The Great Treatise, the Dalai Lama gave a historic six-day teaching at Lehigh University to explain the meaning of this classic text and to underscore its importance. It is the longest teaching that he has ever given to Westerners on just one text, and Westerners have never before had the opportunity to receive such a complete teaching that encompasses the totality of the Buddhist path from the Dalai Lama. 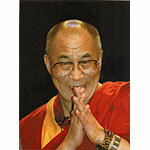 From Here to Enlightenment makes the teachings from this momentous event available for a wider audience. Paperback, 2012 edition, 201 pages.